Former IDF adviser on Arab affairs says PLO officials coordinated with Israeli groups to bring Arabs to demonstration in Tel Aviv. Lt. Col. (res.) 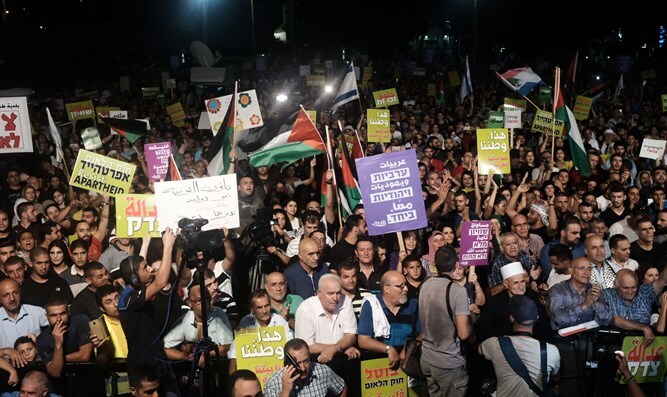 Baruch Yedid, the former adviser on Arab affairs in the IDF Central Command, presented the full details of the Palestinian Authority's (PA) involvement in the Arab and left-wing demonstration against the Nationality Law in Rabin Square on Saturday night. In an interview with Anat Davidov and Yinon Magal on Radio 103 FM, Yedid spoke about the telephone conversations between PA officials and the protest leaders in the Arab and Bedouin sectors. "Over the past weekend, the committee on interaction with the Israeli public, a committee subordinate to the PLO - at the behest of Abu Mazen (Mahmoud Abbas) - was working to bring the Israeli Arab public to the demonstration on Saturday night in Tel Aviv," Yedid said. When asked what sources he relies on, he said, "I rely on conversations I have had with officials in Ramallah, and members of the Interaction Committee do not deny or confirm this. Moreover, it should be noted that telephone calls were made from the committee in the PLO building to left-wing organizations from Israel." When asked whether there was any PA funding for the demonstration, Yedid replied: "I cannot point to funding or to the flags that have become the focus of the controversy, but mainly to the need to reach a large audience for a demonstration against the Nationality Law. One of them even remembered the demonstrations that took place at the time on Rothschild and told me that they died as soon as political organizations rode on them." "There is no doubt that they understand that this is a self-flagellation. This committee is very careful to intervene in internal Israeli affairs since the current defense minister denied their entry permits to the state. Abu Mazen also recently said that the people should decide what the nature of the national law is, and on the other hand, it is important to emphasize that the committee did act to bring many people to this demonstration. "Abu Mazen recently published a visit to South Africa that the national law is racist, and the State of Israel proves that it is an apartheid state."